The home PC decided to act up and we're now waiting for the spare part to arrive. Hopefully by end of this week it will get sorted out. In the meantime, I'm using Capt'n Hook's Macbook and the thing is all my photos are in the PC, my back up hard disk cannot be read by the Macbook grrrr... I only have some stir fry dishes uploaded in my flickr album, so bear with me ok. This post is dedicated to "quick and easy" Celine (Life, Love and Me) since this is another easy peasy dish but can look great to even serve to guests. Super healthy cos I only have this dish with brown rice as it has protein and fibre altogether in one dish. This dish comprises of firm tofu, assorted mushrooms (you can use all sorts of fresh mushrooms) and carrots for colour; served on a bed of blanched dou miao (pea shoots). Just need to shallow fry firm tofu that has been sliced into squares and set aside when golden brown. In the meantime, quickly blanch some pea shoots, drain and place them on the serving plate. Using the same pan on medium heat, make sure the amount of oil is just enough for your serving size. First stir in some sliced garlic. When it's fragrant, add in the sliced carrots and stir. Next stir in mushrooms and fried tofu. Pour in a little water, a few dashes of oyster sauce and a tiny dash of dark soy sauce which you can omit. I've used it just for some colour. Season with some white pepper. Taste and adjust accordingly. Simmer for a few minutes or till liquid is dried up (you can add cornstarch solution to thicken). Serve this over the blanched pea shoots. I loved the colour of how this dish turned out, it's so vibrant and pretty... makes the dish looked appetising. I've used eryngii mushrooms, carrots and yellow capsicum (bell pepper). If I've added some red and green capsicum, my dish would have looked lovelier! Very very simple, just heat a little oil and add in some chopped or thinly sliced garlic. Once fragrant, stir in sliced carrots. Pour in a little water to soften the carrots, omit this if you like your carrots to be crunchy. Cook for a couple of minutes. Next mix in the mushrooms and capsicum. Seasoned with salt and black pepper. Dish up and serve with steamed rice. Anyway, we dropped by for lunch with my brother recently and I'm glad that the roast meats here are still going strong. Instead of push carts, the stalls have gotten permanent roof over their head now. Since it was around 1 o'clock, there were vast amount of choices available. We opted for 1/4 roast duck, 1/4 sesame seeds roast duck and a plate of siu yoke (roast pork) and char siu (bbq pork) for 2 person. With 3 plates of rice and 2 cups of chrysanthemum tea, all these cost us RM47 only. Seems reasonable to me. Price aside, the most important factor is the taste. At least the duck is flavourful, not bland at all. The sesame version have extra crunch on the skin which lend a nutty bite and taste. My favourite! Whilst the glistening char siu stood out for not being sickly sweet, the siu yoke is just all right. Smooth with crispy skin but lacked the flavour of 5 spice powder and salt. If you can read Chinese, you can see the prices. Click on the photo to view a larger pic. Onn Kee's stall is located by the road side, a stone throw away from KTZ Kepong and don't get confused over another roast duck stall which is operating side-by-side. If you sit long enough, you'll be able to see which stall has more customers :p and they are opened for lunch till all roasts are finish around afternoon. It has been a week since the massive 9.0-magnitude earthquake occurred at the northeastern coast of Japan which creates extremely destructive tsunami waves which hit Japan. The earthquake and tsunami have caused severe damage in Northeastern Japan, leaving thousands of people confirmed dead, injured or missing, and millions more affected by lack of electricity, water and transportation. At some area, it's even snowing. It's also not helping when there's a nuclear crisis unfolding in Fukushima. Google has a Crisis Response page where you can find resources related to this current crisis. It's a fantastic page set up with all information such latest updates on the situations, important links and telephone numbers, transportation statuses links, shelters and even a person finder. You can also find links if you wish to donate to Japanese Red Cross Society, International Medical Corps, Unicef and Save the Children. All these within one page which is excellent! The Embassy of Japanese in Malaysia has informations with regards to this as well with various links on how to put in your donations. If you have PayPal account, you can also do so via them. CIMB Bank (account name: MERCY Malaysia, account number: 1424-000-6561053, ABA Swift Code: CIBBMYKL). Donations via cheque are payable to MERCY MALAYSIA (please indicate at the back of the cheque - Japan Earthquake Relief Fund). To donate online, please visit www.mercy.org.my and inform via email that you wish to donate to the Japan Earthquake Relief Fund. Cheque should be made out to the “MRCS International Relief Fund" with the words “Japan Earthquake and Tsunami” written at the back of the cheque. Cheques should be made payable to "Tabung Bencana NSTP-Media Prima" and send to NSTP Finance Department, 31 Jalan Riong, 51000 Kuala Lumpur or at any of the branches. Go to World Vision Malaysia and download the form. The current efforts are to distribute blankets, bottled water and sanitary and hygiene supplies. Priorities include supplies for babies and children. You can also choose to do it via Milkadeal. All collections will be channeled to Malaysian Red Crescent Society. Groupon is also channeling to Malaysian Red Crescent Society and all donations will be matched Ringgit-for-Ringgit up to the total donated value of RM25,000 by Groupon. Pavilion KL fund raising is on till 17 April. You can put your donation at Level 3, Concierge Desk. Buy a tee shirt, there's charity sales plus food & beverage deals. Click here for more details. We're very sure there are plenty of other means but here are just a few. 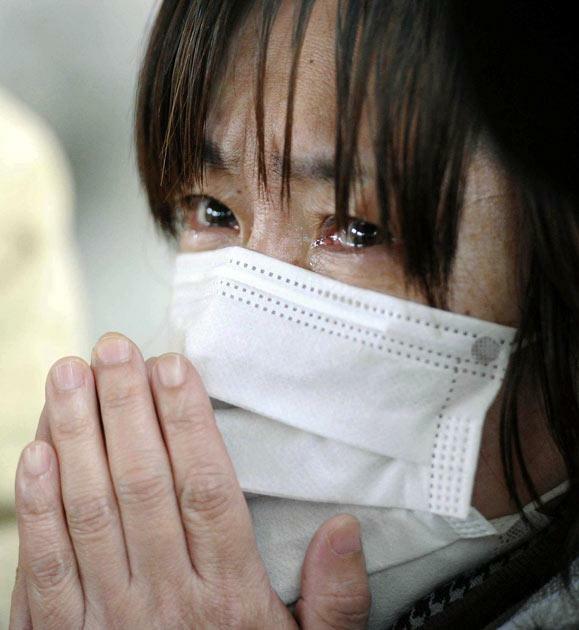 Let us all pray for Japan, a speedy recovery and the nuclear issues to be resolved as soon as possible. I've made many versions of Beef Stews and each time using different ingredients, usually with what I have on hand. Since it's St. Patrick's Day "season", I've made one using Guinness stout based on Jamie Oliver's Beef & Ale Stew recipe and it tasted superb! This beef stew of mine is the simplest with the least amount of ingredients used by far. 1. Season the beef with salt and pepper. Dust in flour and shake off excess. 2. Heat pan and pour in some olive oil. Brown the beef cubes on all sides, remove and set aside. 3. If there isn't enough oil in the same pan, pour in some to sauté the chopped onions and celery. Fry till brown or caramalised before adding the vegetables except mushrooms. Stir and fry them for a couple of minutes before adding the beef. 4. I transfered them into a pressure cooker and pour in Guinness stout. I've also added about 1/2 cup of water as I liked my stew with lots of gravy so that we can mop them up with bread. You can use a normal pot, just that you need to keep it on low fire for about 2 hours or chuck into oven for about an hour or so on moderate heat. 6. When done, serve hot with crusty bread or mash potatoes. Since I've quite a number of mails on the brands and where to get pressure cooker in Kuala Lumpur, so let me have my say here. My pressure cooker was a gift and it's a hard anodised Futura brand and it's from India. Since it was a gift, I've no idea where to get this in town as so far I've not seen this in Kuala Lumpur. Actually one does not need to buy expensive brands for pressure cooker as the cheaper ones especially from India worked very well. Spare parts are easily available too but don't worry too much about this as usually one just need to replace the rubber seal on the lid when it's worn out. My friends who have relatives in India told me that the Indians use pressure cookers extensively for the daily cooking. As far as I know, there are two pretty popular Indian brands we can easily get here and they are Premier and Prestige. Premier is available at Jusco while Prestige can be found at most Indian departmental stores at Lebuh Ampang, Brickfields and Klang. There's one located inside Bangunan Mariamman (behind Sri Maha Mariamman Temple, or diagonally opposite Pasar Seni LRT Station) which the name escaped me now. There were 2 shops can be found along Lebuh Ampang. The prices are fair, if I can remember correctly an aluminium 5l pot would most probably cost around RM200 or less and you could actually ask for a discount. A few of my ex-colleagues got these and were mighty pleased with their purchase. Well, the reason of lids being blew off basically boils down on how you use it. Just read the instruction manual and follow the steps and you'll be fine. Most importantly, you will need to wait for the pot to cool down so that the pressure will let off in the process and also to let the food to continue to cook. However, there are ways for you to let off the pressure quickly, just refer to the manual as each pot operates differently. Based on my knowledge, the difference of paying extra for expensive brands are they have safety features incorporated into the design. Most of them won't allow the lid to be opened until all pressure is released. So there you go... and I hope this helps if you're still deliberating to get or use a pressure cooker or not. In conjunction with St. Patrick's Day today, I'm featuring this Guinness Stout Ice Cream that I've churned using my mini Kenwood ice cream maker. It's still work-in-progress as I need to fine tune the way to make the ice cream. As you can see from the picture, it has some icicles formed obviously I've not churn it long enough but seriously, not really my fault! It's the machine!!! I think it has been churning like more than 1.5 hours before stashing into the freezer but it's still not really fluffy and creamy :( I need an upgrade! As for the recipe, I've used Alice Medrich's recipe from Pure Dessert. Since I can't find any heavy cream, I've used thickened cream instead. So clearly it's not as creamy as I would like it to be. I supposed the reason could be one need the custard to be really creamy as the Guinness would dilute the custard quite a fair bit. Flavour wise, it's not too sweet and the Guinness flavour is not strong enough. Hence need to work on this to improve the texture. 1. In a saucepan, combine the cream, sugar, and salt and bring to a simmer over medium heat. 2. In a mixing bowl, whisk the egg yolks to break them up. Pour the hot cream mixture slowly over the egg yolks, tempering them by whisking constantly. 3. Transfer the mixture back into the saucepan and cook slowly over medium heat and stir constantly. The mixture will thicken and remove from the heat. 4. Strain the custard to remove any bits of cooked egg into a separate clean bowl. 5. Mix the Guinness stout into the custard mixture. Refrigerate for at least 4 (preferably 12) hours before churning according to your ice cream machine. Remember my last review on Tean's Gourmet Curry Chicken Paste? Since it was so favourable, I moved on and tried the Sambal Tumis sauce but I did not put up a post since the photo didn't turn up looking delicious :p The sambal tumis made really good stir-fry of the 4 Heavenly Kings of petai, four angle beans, long beans and brinjals! A short cut way instead of using the mortar and pestle to pound away the spices. I've also tried the Vegetarian Curry Paste. Just like curry chicken, it's so so easy. Just prepare the vegetables you liked, in my case I have carrots, long beans, cabbage, brinjals and tofu puffs. Then just followed the steps printed on the packet and voila... a pot of vegetable curry in less than 20 minutes (including the washing and chopping but excluding the soaking time :D)! However, I didn't quite like the taste of this curry as I find the spices too strong to my liking but Capt'n Hook liked it though. I guess no harm in trying as you may liked it as one man's meat is another man's poison. If you're a big coffee fan, you might not want to miss this event oganised by F! By Buffalo Kitchens which is located above Chawan. There is coffee tasting and hands-on latte art training plus competition going on this Saturday, 19 March 2011 from 2.00pm to 6.00pm. 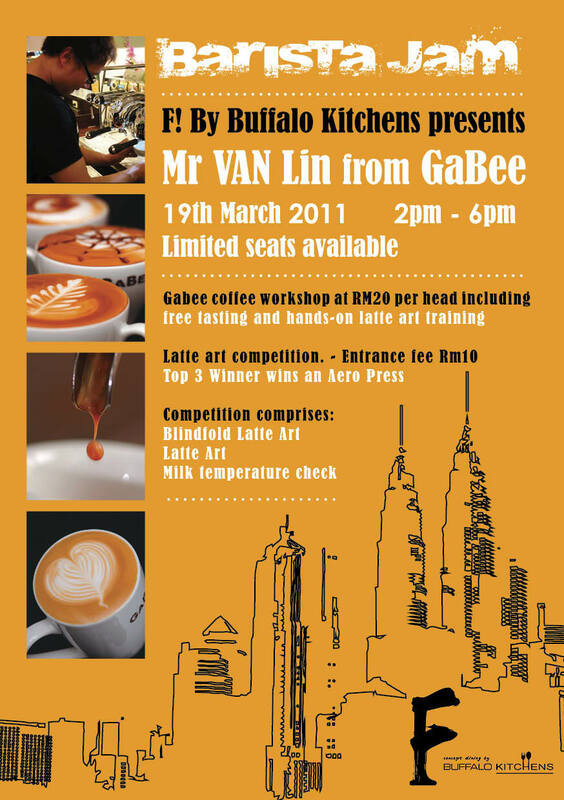 It will be conducted by award winning Van Lin from GaBee. I just can't resist pimping this cooking camp here as I find this series of cooking camps very interesting and seriously affordable too. Organised by The French Culinary School in Asia which I have the privilege to attend a session with Jean-Michel Fraisse and Jean François Arnaud on Häagen-Dazs' Christmas creations. I was told that these cooking classes are meant for home cooks or gourmet food enthusiast. The cooking camps are a series of demo classes to learn how to cook global food. On the schedule so far, there were camps for Italian, Spanish, French, British and American dishes. These camps will be helmed by Chef Jean-Michel Fraisse who will take one through three-hour class on global dishes. Priced at RM200 per person per class, you tell me if it's reasonable or not. Perhaps you will if scroll through the schedule below. Oh yea... you can also purchase the Leisure Cooking Class vouchers* where 5 classes would cost RM 850.00 or 10 classes for RM1,500.00 which is valid for leisure cooking classes and camp (*Terms and Condition Apply). The difference of Leisure Cooking Class with these camps is product voucher will be given out to redeem products available at our premise on the spot after the cooking camp. Nevertheless, terms and conditions apply on the value of the product voucher. The schedule and details will be available on The French Culinary School in Asia website next week but I have the schedule here. Many famous dishes today, including what is popularly known as the Russian Salad, is French in origins. Come and discover what’s so great about French food. In this class you will learn some of the most iconic dishes of France. The French are good at taking the most simple of ingredients – such as onion and apple – and turning them into the most delicious bites. Fine ingredients and techniques are at the heart of French cooking, and this class, using foie gras and seafood, illustrates this perfectly. Bet you have heart of Mulligatawny Soup (yes, it’s British, not Indian) but have never tasted it. 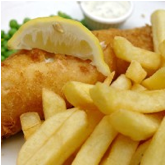 Here’s your chance to find out… and also find out the Brits’ way to make fish and chips. 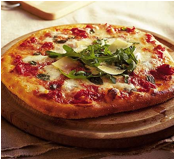 Apart from flat, open-face pizzas, in Italy they make what is sometimes called a ‘folded pizza’. Whether you like it creamy, light, or slathered in tasty tomato sauce, this class will show you the different style of preparing pastas and making pasta from scratch. Are you the one who like Spanish food and enjoy cooking? Join Chef Jean Michel on how to prepare Tortilla, Albondigas, Marmitako and Dolce de Leche. Don’t Miss it! Join us and learn how to make Pan Con Tomato, Piquillos Peppers, Paella Valenciana and Catalan Cream. Who can resists these! Experience the best in American food with Chef Jean Michel’s secret recipes. Indulge in some exciting American recipes inspired by Chef Jean Michel. You will find the recipes and techniques of making great Coleslaw, Chilli Con Carne and New York Cheese Cake. Don’t miss it! So let's get cooking delicious global dishes! If you lived in central Cheras, chances that you would know where to dig for roast duck and surprisingly both errmm I won't say famous but let's say popular shops are located in Taman Connaught. Just that one is at the start of the road, Restoran Yi Kee (near to CIMB, which also sells roast goose) and Sun Ming Restaurant which is located at the end of the road. To get to Sun Ming, at East West Link just turn left at the road where BHP is located and another immediate right. The shop is near Domino's Pizza. If you know where is Restoran Sim Hap Kee or Elegant Inn, Sun Ming is located at the road behind, parallel to them. Don't be alarmed when you see long queue from the chopping and serving area up front of the restaurant as there are table service as well. Usually people queue up to take a look of what is available and select from the wide variety of the food on display. This place is always pack so don't be surprised if you need to share table with strangers. This time round Capt'n Hook and I ordered quartered roast duck, the dark meat portion; a plate of roast pork and a black bean soup plus a glass of hot Chinese tea (which came up to RM31.90). No doubt the duck meat is juicy but somehow the skin is not crispy, perhaps they have been on the display rack for a while. Taste wise, it was ok but doesn't blow me over like Restoran BBQ Kong Meng (Taman Maju Jaya, Cheras) or Onn Kee (in Kepong). Even the roast pork is just so-so with the exception of having a crispy skin. I loved the soup though. It's double-boiled with both pork ribs and chicken, hence the flavour is stronger. The texture of the black beans were great too. Service is quick but the wait for the food to arrive might take a while especially during peak hour. If you come with friends, expect to raise your voice up during your conversations as the place is really noisy hehe typical of a Chinese kopitiam style shop. I was drooling over the glistening char siu that our tablemates have ordered, so next round, we ought to try that and the other items as well like the yong tau foo cos they looked plump with fillings. So to make this dish, slice firm tofu into squares. Pat dry with paper towel before frying them in some oil. Once the tofu squares are lightly browned, remove and set aside. In the same pan, if there are still a lot of oil, remove them, if not enough (about 2 or less tbsp depending how much minced meat you have) add some. Add in some chopped garlic and fry till fragrant. Then stir in minced meat (can be chicken or pork, both are equally delish, marinade with some soy sauce, ground white pepper, a dash of sesame oil and a little cornflour). Next stir in soaked and sliced shiitake mushroom. Once the meat is cooked, pour in some water, a couple dashes of oyster sauce and dark soy sauce. Season with some ground white pepper. If you prefer a saltier dish, you may adjust with some salt but seriously oyster sauce alone would be good enough. Add in the fried tofu and let it simmer on low heat for a few minutes. If you wish, pour in some cornstarch solution to thicken up the gravy but I prefer to simmer mine till drier and the liquid thickened up. Dish up and serve with steamed rice. Has since closed but there's a full fledge restaurant called Empire Serai located at Empire Shopping Mall. I was feeling hungry but dinner appointment is like an hour away. So we headed to the Food Republic at Pavilion to check out what snacks that can hold my hunger at bay. After a walkabout, we decided to have some satay (skewered and grilled meats) at Serai Satay Bar. Looking up the menu, Capt'n Hook and I would be sharing Set C (RM9.60) of 3 sticks each of chicken and beef satay. A teh tarik (RM3.00) for him and chai teh tarik (RM3.20) for myself. Our frothy teh tarik (pulled tea) came first and I'm liking my chai version where the spices are subtle but yet flavourful. Best part, it's not sickly sweet. The satay sticks came in a tall cup. There's a cup on the side where the peanut sauce is stored. How clever! You can actually have your satay on the go this way. The satay sticks are accompanied with 2 sticks of cucumber, red onions and ketupat (rice cake). Each meat skewer I have to say have a rather hearty portion of meat. Both meats are well marinaded that the meats are good even on their own without dipping into the peanut sauce. The sauce is a little too thin to my liking and lack the hotness from additional sambal that we're used to get at Satay Malaysia or Satay Kajang Hj Samuri. Overall, I personally think it's a great snack but really as a meal on it's own, I think may not be enough for big eaters. A little expensive too but then again this is Pavilion KL. There isn't any service charges nor Government tax imposed yet. I've read in the papers that they have a restaurant Serai at Empire Shopping Gallery opened. Would like to head there when there's opportunity. Thank you guys for your well wishes. I think I'm better now albeit the lingering cough, something that will take time and numerous concoctions to cure. Now, let's get back to some blogging business. Did you know that before Shin Kee Beef Noodles Specialist operates from the hole-in-the-wall shop at Jalan Tun Tan Cheng Lock (opens from 10:30am to 3:30pm); they started off at a cart at the lane between Hong Leong Bank and Chinatown Food Court at Jalan Hang Lekir? I used to go there for a bowl of hearty beef noodles after office hours with my colleagues then. The stall is still operation now but opens only in the evening. There are few tables available here, so most times one might need to share a tiny table with other patrons. Service is very quick here and I have my bowl of dry mee and hor fun (flat rice noodles) with beef balls and meat slices in a jiffy. The mee served here is not of the yellow oily kind but it's the flat egg noodles. Gave the bowl of noodles a thorough mix with the minced meat and slurped them down. It's still as good as I could remember. So I'm glad that I can head to Shin Kee at Jalan Tun Tan Cheng Lock for brunch or lunch and to Jalan Hang Lekir for dinner. Well other than Shin Kee, Soong Kee is our favourite too for a quick and easy dinner. The best soupy version for me can be found at Lai Foong Restaurant. Nearer home, we loved Restoran 3U for their beef balls, beef tendon balls and stewed beef noodles!